InTime is a video-poetic work, a cinematic poem. The image, a quad split screen, is divided in four vertical bands, slightly askew from one another. 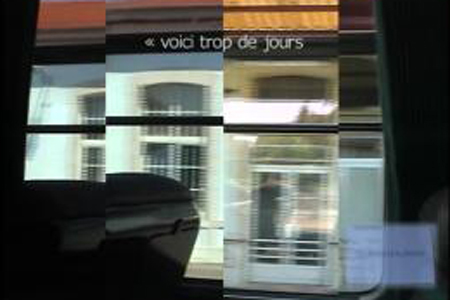 A series of silent sequences produced by the artist during a train trip play on it. The moments captured in the film are superposed and repeat in a temporality that seems suspended, slowed down, and stretched out. Sentences are tacked onto these images like sober annotations, similar to standard sub- or sur-titles. The texts come from the work Intimate by Pierre Alféri. This work is a collection of letters written to anonymous people who all have the common trait of being designated by their attribute (“Dear relative,” “Dear beloved,” “Dear mercurial one,” etc.). The letters are addressed to characters; they can thus address another in the intimate space of correspondence or themselves in an introspection put into words. 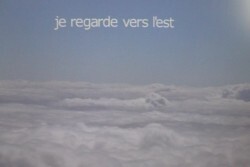 Texts and images are synchronized with sound compositions, made with the musician and singer Rodolphe Burger. Music participates in the poetry of the piece, like a rhythmic counterpoint to underscore or complicate the rhythm of the sentences. Images, text and music intertwine without harmonizing excessively, such that the whole dreamlike dimension of the work emerges for short, accidental moments. The main subject of the work is time; it is about being immersed in time, living it without dominating it. The sequences captured by the camera, like sketches made on a bench or notes scribbled in a notebook, direct the gaze to moments of life, moments of candid intimacy from the lives of unknown passersby. These moments are stretched out, slowed down, or accelerated. Pierre Alféri (1963-) is a French writer, essayist, and poet. His work plays with the canons of language and writing. He stretches and fuses categories to invent new poetic forms in constant renewal.